Pressure Cooker Outlet is brought to you by Red Hill General Store, Inc.
We are authorized dealers of Presto, Mirro, Wisconsin Aluminum Foundry (All American) and other leading products made conveniently available to you online. Our first retail store, customer service, web development offices and warehouse are located in Hillsville, Va. That's in the Blue Ridge Mountains of Southwest Virginia. The mountain area is known for its self-sufficiency and with it a knowing-how-to-do has been passed down. Our employees and customer support team are industry experts. We've been in business since 1998. You can't beat the (almost) 20 years of pressure cooking and canning experience. We are a company that preserves a seasonal, fulfilling way of life by passing the best of our knowledge for happier, self-sufficient living in the name of the future. Quality merchandise and good service doesn't happen by accident. Our commitment to fair price, trusted products and first-rate local customer service in the USA has been central to our identity and purpose since 1998. We strive to build with the same practical integrity we use to select and ship our products, with greater pride in our workmanship and healthy everyday living for all. Pressure Cooker Outlet makes ordering via the Internet safe, private and secure. We use Secure Sockets Layer (SSL) technology to encrypt all personal & order information. As a top retailer on the Internet, Pressure Cooker Outlet has a firm commitment to privacy and does not "sell" customer information to third parties. We offer quick turnaround of in-stock items and all of our products are first quality and factory new; we do not sell seconds or damaged products. Follow our pressure cooking and canning blog here. The adventurous and whimsical grandpa (or father of our owner) Edwin Largen was an inspiring example of the joy found in plain living. In Appalachia folk tale tradition, he was a storyteller. He told his stories loud with enthusiastic entertainment and laughter. He was a farmer and dedicated his life to growing crops and raising food for his family. Most of the stories he told were about the animals, people and important moments of his childhood. The setting was here in the rural mountains where simple living was a way of life. His uncle was so strong he could lift a 500lb hay bail on his back. His brother Price was thrown into a tree by a heard of stampeding cattle. He kept his land working so he always had something else to do. He admired and taught us frugality and invention. He recycled everything. The house, the shed, the fences and everything else were all created using what he had. He loved simple living well before it became a lifestyle choice. He believed and proved true that with a little ingenuity a person could create a wonderful life from close to nothing. His stories were filled with chickens, cattle, goats and horses, inventors and visionaries, goofball ideas and technological miracles. It is that heritage that Pressure Cooker Outlet uses as operational guidelines. We promote those things that contribute to a simple living while treating our customers with the respect and frankness grandpa taught us to have with our neighbors. Grandpa loved working out his theories by practicing their practicality in the real world. That’s what we have been doing with Pressure Cooker Outlet. Perhaps big companies with economies of scale for efficiency (lacking actual customer service) will put us out of business. In honor of Grandpa, we believe there’s something to having small and simple on our side. Call us and ask for a shipping time – we’ll walk to the next room (the shipping department) and guarantee your order will go out in today’s shipment. We keep track of our mess ups and have 99.6% rate of on-time shipping (with a .031% standard error) for the last 15 years. We have a 30-day return policy in addition to the regular manufacturer warranty to provide you with the service we’d expect ourselves. Cucumbers to be preserved as pickles! 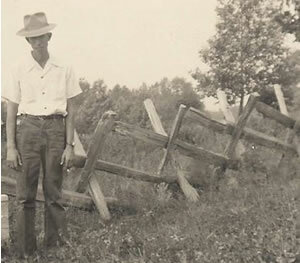 Edwin Largen (Above) at Groundhog Hill on the Blue Ridge Parkway in Carroll County, September 1951.